we are able to track approaching weather disasters. Hurricane Katrina was taking aim at New Orleans one of the last times we heard the call of our sewing rooms. This past autumn was not different. A Hurricane named Sandy was leaving Cuba and heading for New York, and promised to be the latest “storm of the century.” Second in damages caused only to Katrina, Superstorm Sandy’s surge hit New York City on October 29, 2012. Flights were cancelled, tunnels and bridges were closed, subway, bus and commuter rail service was suspended. Thousands of homes were destroyed. Lives were changed. 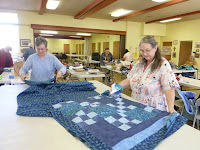 Our local quilt guild, East Bay Heritage Quilters (EBHQ) is well known for sewing in the wake of disaster. Over the years, quilters in EBHQ have made quilts for those affected by the Oakland Hills fire, Hurricane Katrina, the Fukushima Daiichi earthquake and tsunami, the war in the Congo, the tornado in Joplin, Missouri, the tragedy at Columbine, the shootings at Virginia Tech; the list is long. Guild members also routinely make quilts for fragile children in hospital care, for returning service members, and for foster children aging out of the system. Congress lumbers in response to such overwhelming disasters, natural and otherwise. Quilters do not. Judy Jensen, a warm and spirited woman who has been quilting since 1971, lived in Brooklyn for 27 years and is a member of EBHQ. After talking with old friends from Brooklyn and hearing news reports about the survivors and their needs, she knew people in our community could help. When EBHQ put out a call for "Sandy" quilts, she had a way to be part of a collective effort. Judy, Deanna Davis, and Susan Dague hatched a plan to act. They visited the repository of fabric donated to the guild’s community outreach project, and began pulling together groupings of fabric which would become gorgeous quilts. 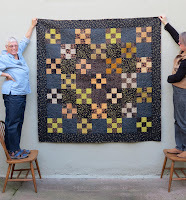 Judy and Susan began by making kits to assemble between fifteen and twenty quilts. Word spread. Other quilters pulled unfinished quilts from their stashes, and contributed much more fabric to the cause that was soon known as Sandy Quilts. The Albany United Methodist Church, at 980 Stannage Avenue, donated five days’ use of their work space for our quilters to meet, and to work together on these quilts. Deanna Davis, EBHQ president and chair of the guild’s Community Quilts service aspect, came in to work on Sandy Quilts with four bins of fabric on any given work day and would leave with four bins of fabric, donated from guild members. The number of quilts being lovingly crafted from scraps grew, and grew, like a textile version of Stone Soup. Some quilters made blocks. Others built quilt tops. Still others measured batting, and made backs and binding for the quilts that were being borne. 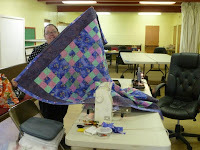 A handful of local quilters offered their skills in quilting the finished tops. Another handful lovingly sewed on the binding, and the labels. Helen Green, who sewed bindings with the smallest and loveliest hand stitches imaginable, listened to Harry Potter while she stitched. Her friend Diane, whose husband was undergoing chemo at the time, made incredible quilt tops to be creating something beautiful during her difficult time. By February of 2013, this group of women had built 70 quilts, ready to ship to contacts made by Judy, in Far Rockaway, Staten Island, and New Jersey. 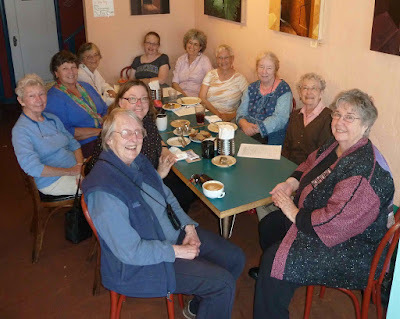 EBHQ also harnessed the power of social media, using Facebook to find a friend to help transport some of the quilts while on a personal trip to NYC. Our friend Jim chronicled his leg of this journey on Instagram. Other large boxes went by post. From all accounts, these quilts were warmly received by people whose lives were shattered by the storm. 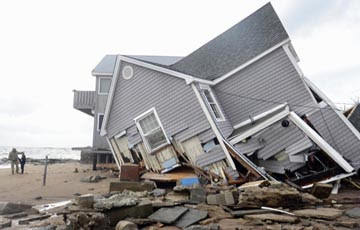 It is six months now since Superstorm Sandy struck the coast, and most of the aid survivors are receiving is still trickling in from grassroots sources, managed by nonprofit aid agencies, working long, long days. One thing is guaranteed. When the next storm strikes, members of our quilting community will once again return to their sewing rooms to create warmth and comfort in the form of a quilt. I received your quilts! They are absolutely beautiful! I showed them off to everyone in the office. I don’t know how I will decide which families in need to give them to! Today, we received your beautiful quilts! Along with quilts created by fellow volunteers from across the country we continue our distribution to families impacted by the Hurricane Sandy. Your compassionate donation brings a good deal of comfort to those displaced and devastated by the flooding. Many residents along the bayshore side of NJ (where Blankie Depot is headquartered) have lost their homes and are just beginning the road back through community cleanups and remodeling projects. Thank YOU for sharing your time and creative talents with NJ residents affected by the storm. It has been such a pleasure to take calls, respond to generous emails and experience how beautifully the crafting for charity community comes together to help others. Eight beautiful quilts arrived today! The children's panels and the larger quilts are just terrific. I children's quilts are heading to Riverview Medical Center in Red Bank, NJ and the larger quilts will travel to the group home we serve in Paterson, NJ. Hugs to all the quilting gals! Thank you so much for your in kind donation of quilts to The Action Center for Education and Community Development's Sandy Disaster Relief Program. Our efforts would not have been successful without help from people like you. It is people like you that make the brotherhood and sisterhood of mankind a reality. Our community has been uplifted by your dedication and generosity. Again thank you and may god bless you all.